After a year in production with just the straight 6, the second generation of BMW’s top of the line 7-series sedan got a V12 option in 1988. 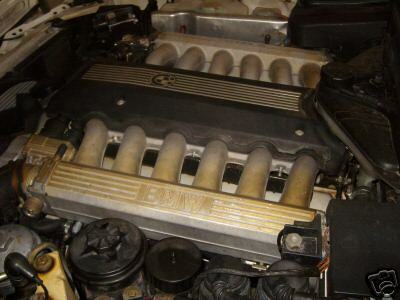 This engine, BMW’s first production V12, used Bosch Motronic M fuel injection and made a fairly effortless 296 bhp from its 5.0 liter/305 ci size and was designated M70. BMW’s M70 V12, courtesy of Sv650k4 from the Wikimedia Commons. Of course, at the eye-popping base price of $69,000 (about $150,800 in 2018 dollars or about what a 2019 BMW M760i sedan goes for) the purchaser also got almost every piece of equipment BMW could put in the car. Four-wheel anti-lock disc brakes, traction control, ZF’s Servotronic power steering, a self-leveling rear suspension, a driver’s side airbag, a trip computer, dual-zone air conditioning, and leather seats were all standard. Beyond this, there were a few options available such as a limited slip differential. In addition, the buyer of a 750iL was paying the dreaded $1,850 gas guzzler tax—the original EPA estimate was 12 city/17 highway (the modern equivalent would be 11 city/16 highway). With a 27-gallon fuel tank, a 750iL owner could expect a range of between 330 to 350 miles with a 10% fuel reserve. Folks do collect the 750iL, but the maintenance costs can be daunting. The 760iL sometimes makes an appearance in the Hemming’s Motor News classifieds and on eBay Motors, but there were none for sale when I updated this post in December 2018. Make mine silver, please, though black also has its attractions.